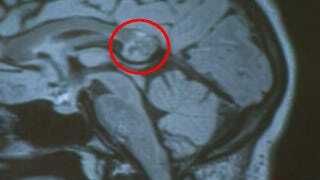 During a surgery to remove an apparent brain tumor in a 26-year-old woman, doctors in Los Angeles were shocked to discover an embryonic twin instead. Although these tumors can originate during embryonic development, they aren’t embryos, and they are not a person’s “twin.” They arise from germ cells, which are the cells that go on to later develop into a person’s gametes (such as sperm and eggs). At early states, germ cells have the ability to turn into any cell in the body. The type of tumor that Karanam had occurs “when a person’s own germ cell multiplies abnormally and differentiates into various different, normal tissues, in an abnormal place,” said Dr. Cathy Burnweit, chief of pediatric surgery at Nicklaus Children’s Hospital in Miami. “It has many of the components that a normal body would have, but it is in no way a twin,” Burnweit said. Rather, identical twins occur when a fertilized egg divides in two, she said. As reported by NBC Los Angeles, the patient, an Indiana University PhD student named Yamini Karanam, had been struggling with reading- and listening- comprehension when she sought out the help of Dr. Hrayr Shahinian, who is known for developing a minimally-invasive technique for removing tumors deep inside the brain. But what the brain surgeon found next surprised even him: the tumor was actually a “teratoma” - [it was Karanam’s] embryonic twin, a rarity in modern medicine, complete with bone, hair and teeth. “This is my second one, and I’ve probably taken out 7,000 or 8,000 brain tumors,” Shahinian said. Karanam awoke to learn what was causing her all that trouble [back home]. For those of you desperate to know what the teratoma looked like (because I know you do), click here to watch the NBC video that accompanies the report.